Ba-Mu-Ma, a major Indian village, was the first known settlement in the present Lincoln area. The inhabitants were the Nisenan (also "Nishinam"), a branch of the Maidu Indians, who had been in the area for more than 5000 years. By 1822 Spanish explorers, followed by fur trappers, penetrated the area. In the 1840's other Europeans were beginning to emigrate from the eastern U.S., and the first farms and ranches were started. White man's diseases, land appropriation, and violence soon brought an end to the Indian civilization here. The gold rush hastened the influx of Europeans. By 1858 there were 10 towns within seven miles of what is now Lincoln. Nine of these were relatively short-lived mining towns; the other was Sheridan, which still exists seven miles to the north. In 1859 the village of Lincoln was born. It was to be the temporary terminus of California's first railroad, the California Central, which had been completed to Folsom in 1856. Thepresident of the railroad was Charles Lincoln Wilson, whose middle name became the name of the new town. The railroad finally arrived in October of 1861. Businesses were quickly established as merchants and others moved into Lincoln from the surrounding towns and mining camps. The new town soon became the transportation and trading focus of Western Placer County. Industry had a much slower start, but in 1873 coal was discovered and became of some commercial importance. The mining of coal revealed layers of very high quality clay, and in 1875 the Gladding, McBean Co. pottery was founded. The production of clay products has been the town's leading industry for over 135 years. In 1890 Lincoln was incorporated, and town government was born. In the same year the Lincoln News Messenger became the town's first permanent newspaper and is still being printed today. 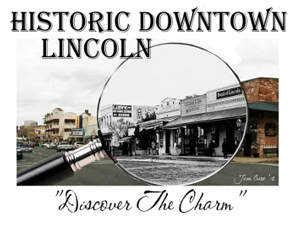 The City of Lincoln, located 25 miles northeast of Sacramento, was named the 2006 winner of the coveted All-America Cities Award given by the National Civic League (NCL) - the nation's longest running and most prestigious civic recognition program. This award recognizes civic excellence, honoring communities in which citizens, government, business and nonprofit organizations demonstrate successful resolution of critical community issues.